Just so you know, I was given this free from Sennheiser. Keep that in mind while reading. I work from home about one day a week. When working from home I use a speakerphone instead of a headset. 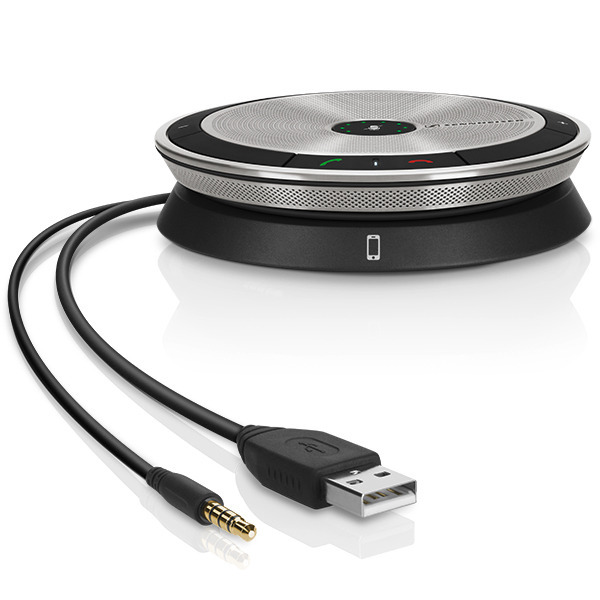 For the past year or so, that speakerphone was the Plantronics Calisto P825-M. 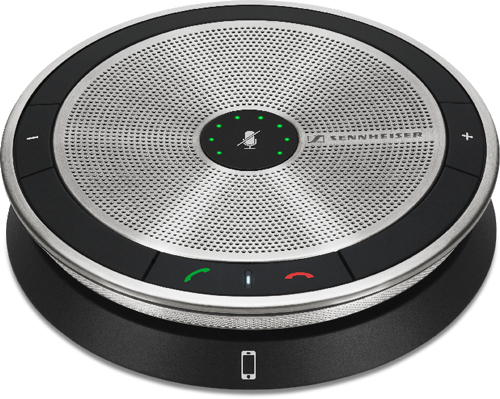 Yesterday I received the Sennheiser speakerphone just in time for my usual Thursday work-from-home day. So I was able to give it a good run through its paces today. First off, here are the general features of the device. It’s Lync certified so you can plug-and-play it to your PC. This worked perfectly. The top of the device has 5 buttons. On the far left and right are volume down and volume up buttons. The center of the speakerphone has a few features. You can press it to mute/unmute the call. When doing so, the lights around the center button turn red when muted and green when unmuted. The lights are also a volume indicator. As you turn the volume up, more lights will get lit up in a clockwise direction. Hitting the volume down turns lights off in a counter-clockwise direction. The lights in the middle are also a charge indicator. The charge is indicated by blue lights. The more blue lights you see, the more of a charge you have. Yes, this device has a battery in it so you can use it as a speaker for music or as a speaker for your mobile device. Sadly it does not have Bluetooth connectivity. At the lower end of the device are the call answer and call hang-up buttons. Between the 2 buttons is a white light letting you know if the device is on or not. Despite not having Bluetooth, you can easily connect a mobile device via an included 3.5 mm headset connector. Both this connector and the USB cable are ingeniously wrapped around the base of the unit and are pretty well hidden while stored. I was surprised how long the cables are. According to my ruler, the 3.5mm analog cable is 25.5 inches/64.77 cm in length. The USB cable is a bit more generous at 30 inches/76.2 cm. But how does it sound? That’s the real test right? I spent a fair amount of time this morning testing this device with a coworker. We would talk and I would switch the conversation between the Sennheiser and the Plantronics device. From my point of view, that is, the side listening to the output of the speaker, the Sennheiser was a clear winner. No competition, actually. The Plantronics sounds a bit tinny and flat with absolutely no sense of bass. Certainly with the Plantronics my coworker was easy to understand but there was absolutely no nuance. But with the Sennheiser it was like switching from a narrow-band PSTN call to a wide-band Lync call. My coworker sounded much fuller and much more natural. Also from the listening end, I plugged my Windows Phone into the Sennheiser to see how it sounded as a music speaker. While it is no competition to a home stereo, it is very serviceable. There is too much mid-range and the bass doesn’t stand out. But I imagine this is because the speaker is designed for voice with music being a secondary concern. They claim that they have a “profile” to enhance the music and it does seem to work. With the SP 20 connected via USB, set as the default PC audio, and playing music via the phone everything sounds great until a PC “noise” comes in. When the speaker has to play that noise, such as an incoming IM audio notification, the audio turns very flat and dull (and slightly distorted) while playing that notification over the top of the music. Once the notification is over, the music brightens up considerably. Interestingly when you play music on the PC via the USB, the audio is fine….until I plug the 3.5mm jack into the phone. Then the PC audio goes to rubbish. I imagine this has to do with the circuitry inside only able to handle a single quality audio stream and they default to the 3.5mm jack getting that quality stream. The USB gets demoted to a much lower quality stream. If you travel often and just need to use it for listening to music in a hotel room or to improve on the built-in speakers in a laptop then this will certainly perform admirably. Just keep in mind that this is nowhere near audiophile-level audio. And unlike the Plantronics, the Sennheiser comes with a protective case to provide some level of protection to the device while travelling with it. So which one of the two were easier on the user at the far end? In other words, how did the microphones perform? In general, they were very similar to one another. When just speaking it took some concentration from my coworker to pick out the differences. Eventually he said that the Sennheiser sound less “echo-y”. Put another way, he said the Sennheiser sounds closer to sounding like a headset microphone than the Plantronics. I would hope this is the result of Sennheiser marketing slapping the term “echo cancellation” throughout their materials. We leaned towards thinking the Sennheiser was the better performer in this regard. Keeping in mind that this is a speaker phone and not a headset, the microphones on the SP 20 should be passing the music through. If this were in the middle of a conference room instead of my desk at home, you would want to be able to clearly hear everyone talking. But this was certainly no thorough or complete test. It’s very possible that the Plantronics “muddling” the music is it’s attempt to cancel out background noise and highlight the speakers voice in which that’s a very good thing to do. This would require different testing to determine which one is better in a conference room environment. Overall the audio and microphone are much better on the Sennheiser than the Plantronics. Despite lacking Bluetooth, the addition of the 3.5mm jack is a nice touch. The Plantronics has both Bluetooth and the ability to plug in a 3.5mm cable. However it does not let you use it as a music speaker via Bluetooth or 3.5mm connections. At least I couldn’t figure it out. You can use it as a music speaker via USB but the quality is really miserable. The Plantronics was clearly designed solely for call-level quality. The Plantronics does have a screen which is always a positive. It also has a ton more buttons….none of which I’ve ever really used. Understandably this is because my use case is as a single-user speakerphone and not in a conference room. I could see that there is potentially some value to having a number pad and a built-in address book…or whatever all it is this can do. I’ve never used any of those features. I have tried using the detachable microphone. In theory this is a great idea. This would let me walk around and even turn my back on the speakerphone yet the person on the other end would still hear me clearly. But there are two problem with this. 1. When you pick up the microphone it doesn’t automatically switch the input to the microphone. You have to manually press a button. This seems useless to me and quite honestly I had to refer to the manual a few times when I tested the detachable microphone before my thick head remembered there was a button to push. I know Plantronics knows how to do this as some of their other devices will automatically answer a call when you pick up the Bluetooth device to stick in your ear. 2. But the bigger problem is that the microphone doesn’t work well. Or at least mine doesn’t. When I tested the microphone a few months ago with some coworkers they both immediately reported that my voice was filled with static. And this was with the microphone no more than 6 feet/2 meters from the base station. The Plantronics Calisto seems like it is full of good ideas that just didn’t get executed properly – at least for a single-user scenario like mine. I would think in a conference room scenario all of those buttons provide some value though I imagine I would be pushing all of those buttons via my Lync/Skype for Business client and not on the device itself. The price difference between the two is only $7. According to Amazon, the Plantronics Calisto is US$120.99 and the Sennheiser SP 20 ML is US$127.97. I would find it very hard to justify saving the $7. 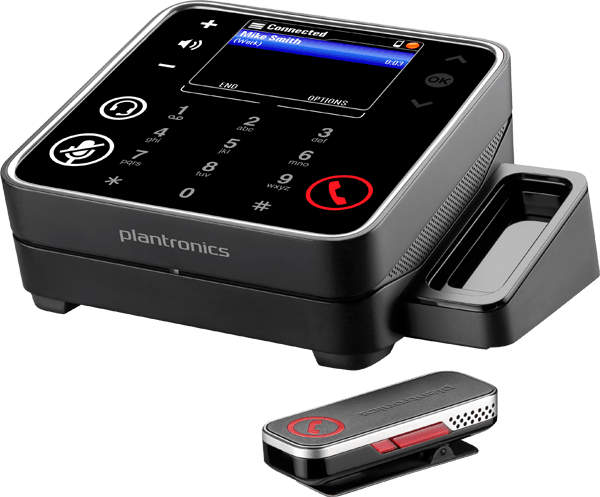 I suppose the primary compelling reason to go with the Plantronics would be the Bluetooth connectivity and all of those buttons. But if sound quality is your primary requirement then this one is a no-brainer. I’d buy the Sennheiser. Every time. The final verdict is this: I’m packing up the Plantronics and taking it back to the office in case we ever need a speakerphone for a meeting. I’m keeping this Sennheiser at home and taking it with me when I travel (which I never did with the Plantronics). if you want to listen to music using the SP20 with the 3.5mm audio plug, long press the middle button until you hear a beep and the round lights turn red. That will be music mode.